I just booked my flight for High Point, North Carolina. For those of you unfamiliar with High Point (often referred to as ‘Market’ by those of us in the industry), the town that hosts the largest home furnishings industry trade show in the WORLD. It is over 10 million square feet and has roughly 2000 vendors. April can’t get here soon enough! Never before has it been easier to find and buy things for your home. Furniture, rugs and décor, oh my! But design has never been about BUYING things. ANYONE can buy things. Design is about knowing WHAT to buy. As an educated and experienced designer, I identify problems and solve them. I don’t guess. Not only is design my passion, it is my profession. I am immersed in design. I spend all day, every day, solving design dilemmas. When I make a presentation to a client, I’m always humbled and happy (but never surprised) when they say “I never would have thought of that.” They hired me to provide solutions; this is my job. 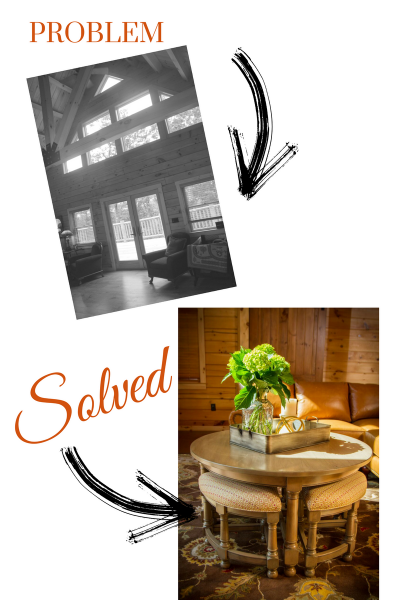 For example, one of my clients built a lovely log home on a beautiful lake in upstate New York. The problem? These clients have a large family and frequently entertain, so they wanted to maxmize seating. They have three dogs, young grandchildren and a cat. So everything had to be child and pet friendly. As I began drafting the floor plan, I knew I needed to add as much flexible seating as possible. We maximized capacity by using a sectional (leather for easy cleaning), and I knew this multi-purpose coffee table/ stool combination would be PERFECT. I selected a soil and stain repellent fabric for the stools and the distressed finish on the coffee table will add patina as it ages. A little design tip: if you have a sectional and frequently entertain ALWAYS use a round coffee table. Your guests’ shins will thank you. Shortly after attending a trade show, I was hired to design a dining room and the adjacent hallway that stymied my client. While attending that trade show, I saw a tailored cabinet that was high on style and tiny on dimentions. I knew it would be great in a small bedroom or a narrow hallway and when I saw this ackward space, which wasn’t deep or wide, I knew it would work beautifully. To complicate the matter, the ceiling height in this hall was 11 feet! My client has an eclectic mix of antiques and newer, transitional pieces and I knew this cabinet would integrate beautifully. It provided concealed storage, was only a few inches deep ,yet was tall enough to make this space look intentional, and it added proper scale. 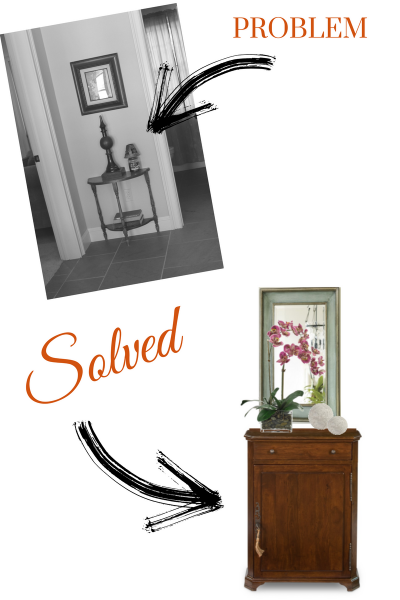 A mirror (to reflect the light), a tall, elegant orchid and two decorative spheres top it off. The rendering below is one we just presented to a client. 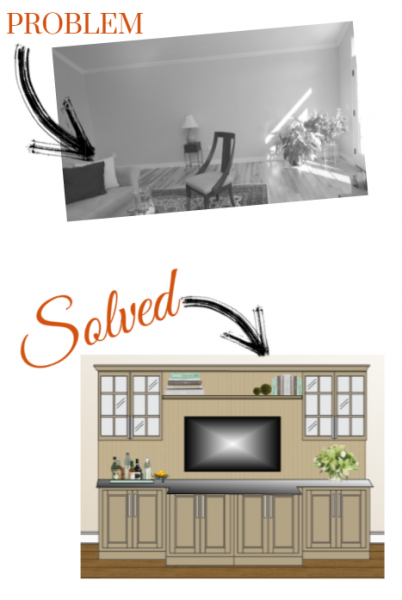 They recently completed an addition and were struggling with what furniture to buy and where to place it. While the addition was large and greatly expanded their living space, it wasn’t large enough for everything on their wish list. I designed a custom built-in to combine three items on their wish list. My client now has a bar, a TV console AND abundant storage. It fills this extremely long and otherwise barren wall and will look fabulous when complete! We updated our menu of services! We added new, yummy photos of recently completed work. Click HERE. If a design project is in your future, find the package that suits your budget and level of desired service and give us a call or schedule a consultation.